A wave-resistant carbonate structure which is gradually built by stony corals, calcareous algae and other reef-building organisms. Warm-water coral reefs occur in the coastal areas of tropical and subtropical regions. The Ocean Data Viewer A tool for easy access to a range of datasets that are important for the conservation of marine and coastal biodiversity. The data can be downloaded or viewed online. Coral Reef Watch provides current reef environmental conditions to identify areas at risk for coral bleaching. Corals are composed of many individual coral polyps. A coral polyp is a relatively simple organism, typically composed of a small cylindrical body, topped with a ring of tentacles which are used to capture food from surrounding water. Polyps are animals of the class Anthozoa, which also contains sea anemones and sea pens. Animals in this group are generally sedentary 1. 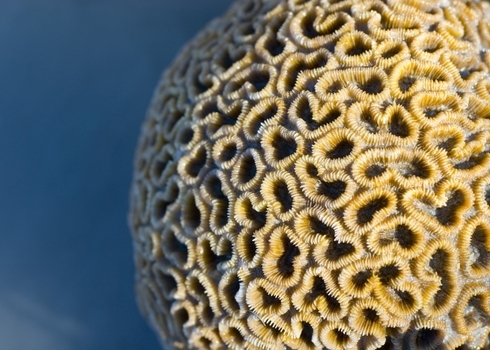 A large number of corals have evolved to build large colonies based around a communal skeleton. Reef-forming corals (scleractinians) are those that lay down stony skeletons of calcium carbonate for protection and support which can take various structural forms. Warm-water corals have a symbiotic relationship with algae called zooxanthellae. The algae provide the coral with nutrients derived from photosynthesis, and oxygen. The coral polyp provides the algae with a place to live along with waste products of respiration (carbon dioxide) which are used by the algae in photosynthesis. This symbiotic relationship is why corals live in shallow waters, allowing the algae access to the sunlight in order to photosynthesise. Warm-water coral reefs are the most biodiverse of marine habitats per unit area, with diversity comparable to rainforests but an area only 5% of the size. 5 Most of this diversity is not due to the corals themselves (there being fewer than 1,500 species of stony corals 6) but rather due to the multitude of organisms that depend on the coral reef ecosystem. 7 Reef species diversity has indeed been estimated at anywhere from 600,000 to more than 9 million species worldwide. 8 In addition, coral reefs are considered to be among the most important ecosystem engineers found in the marine environment. 9 Ecosystem engineers play key roles in ecosystem organisation by providing conditions or resources essential for species to complete their life cycles or by helping to maintain niche diversity such as by providing complex habitat structures. 10 The habitat complexity provided by reefs may be the reason for their high biodiversity and their role as evolutionary engines, acting as ‘cradles’ of speciation. Shallow water coral reefs provide a beneficial environment for evolving new species, which then expand to new environments in the ocean. 11 These key functions of coral reefs make them disproportionately important in comparison to their global footprint. Reefs are also one of the most endangered habitats on the planet 16, facing dramatic declines in abundance as a result of bleaching and diseases driven by elevated sea surface temperatures, with extinction risk further exacerbated by local-scale human disturbances including coral mining, agricultural and urban runoff, pollution, damaging fisheries and the introduction of damaging invasive species. There is frequently a direct correlation between declining reef health and increasing human population, mainly due to pollution and overexploitation 17. Destructive fishing practices are a particular problem, with poison such as cyanide being used for live capture of fish for both restaurants and the aquarium trade. Blast fishing is also very destructive, whereby explosives are used to stun schools of reef fish and cause huge damage to the reef, shattering the structure and killing many non-target species 18. Once the complex reef structure is damaged or destroyed, the niches which provide homes and shelter for the array of species are lost. The proportion of corals threatened with extinction has increased dramatically in recent decades and exceeds that of most terrestrial groups, with one-third of reef-forming corals facing elevated extinction risk from climate change and local impacts. 19 Specifically, 23 reef-forming coral species are listed as Endangered by the IUCN Red List of Threatened Species, and 6 are listed as Critically Endangered. 12. Conserving coral reef biodiversity and the capacity of reefs to generate essential services to local people is a global priority 14, and coral reefs are increasingly the focus of biodiversity conservation prioritisation schemes. They are included in the rationale for Key Biodiversity Area (KBA) and marine protected area (MPA) designation, e.g. the Great Barrier Reef Marine Park. Hughes, T. P., Bellwood, D. R., & Connolly, S. R. (2002). Biodiversity hotspots, centres of endemicity, and the conservation of coral reefs. Ecology Letters, 5(6), 775–784. Reaka-Kudla, M. (2005). Biodiversity of Caribbean coral reefs. In P. Miloslavich & E. Klein (Eds. ), Caribbean Marine Biodiversity: The known and the unknown (p. 310 pp.). Lancaster (Pennsylvania): DEStech Publications. Diaz-Pulido, G., & McCook, L. (2002). The fate of bleached corals: patterns and dynamics of algal recruitment. Marine Ecology Progress Series, 232, 115–128. Reaka-Kudla, M. (1997). The global biodiversity of coral reefs: a comparison with rain forests. In M. Reaka-Kudla, D. Wilson, & E. Wilson (Eds. ), Biodiversity II: Understanding and Protecting Our Biological Resources (p. 560 pp.). Washington, DC: Joseph Henry Press. Kitahara, M. V, Cairns, S. D., Stolarski, J., Blair, D., & Miller, D. J. (2010). A comprehensive phylogenetic analysis of the Scleractinia (Cnidaria, Anthozoa) based on mitochondrial CO1 sequence data. PloS One, 5(7), e11490. Knowlton, N., Brainard, R., Fisher, R., Moews, M., Plaisance, L., & Caley, M. (2010). Coral reef biodiversity. In A. McIntyre (Ed. ), Life in the World’s Oceans: Diversity, Distribution, and Abundance (p. 384 pp.). Oxford (UK): Wiley-Blackwell. Plaisance, L., Caley, M. J., Brainard, R. E., & Knowlton, N. (2011). The diversity of coral reefs: what are we missing? PLoS ONE, 6(10), e25026. Jackson, J. B. (2001). What was natural in the coastal oceans? Proceedings of the National Academy of Sciences of the United States of America, 98(10), 5411–5418. Keith, D. et al. (2013). Scientific foundations for an IUCN Red List of ecosystems. PloS One, 8(5), e62111. Kiessling, W., Simpson, C., & Foote, M. (2010). Reefs as cradles of evolution and sources of biodiversity in the Phanerozoic. Science, 327(5962), 196–8. Bullock, J., Pywell, R., Burke, M., & Walker, K. (2001). Restoration of biodiversity enhances agricultural production. Ecology Letters, 4, 185–189. Moberg, F., & Folke, C. (1999). Ecological goods and services of coral reef ecosystems. Ecological Economics, 29(2), 215–233. Brander, L. M., Van Beukering, P., & Cesar, H. S. J. (2007). The recreational value of coral reefs: A meta-analysis. Ecological Economics, 63(1), 209–218. Bellwood, D. R., Hughes, T. P., Folke, C., & Nyström, M. (2004). Confronting the coral reef crisis. Nature, 429(6994), 827–33. Burke, L., Reytar, K., Spalding, M., & Perry, A. (2011). Reefs at risk Revisited. (Vol. 74, p. 130). World Resources Institute. Cesar, H. S. J. (2002). Coral Reefs: Their Functions, Threats and Economic Value. In Collected Essays on the Economics of Coral Reefs (pp. 14–39). Kalmar, Sweden: University of Kalmar. Carpenter, K. E. et al. (2008). One-third of reef-building corals face elevated extinction risk from climate change and local impacts. Science.